Start your dramatic swing to a haven on our award winning championship golf course, the jewel of the Indian Ocean, Nirwana Bali Golf Club. Nirwana Bali Golf Club at Pan Pacific Nirwana Bali Resort is beautifully set along the dramatic coast line amongst manicured gardens and traditional Balinese rice paddies. 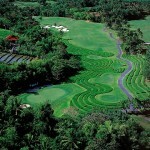 Designed by legendary golfer Greg Norman, the course boosts five ocean-side holes, three cliff-to-cliff tee shots and eight holes sculpted into the terraced rice fields. 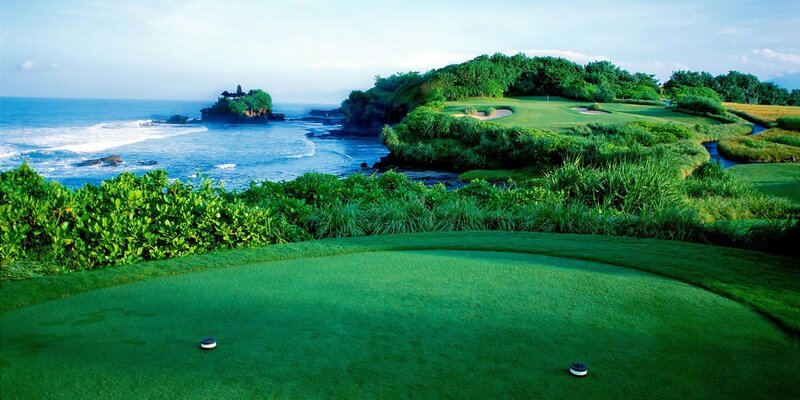 The signature Par 3 7th hole overlooks the famous Tanah Lot temple and is by far the most photographed hole on the course. The diverse and meticulously maintained course provides resort golfers and seasoned professionals with an unparalleled golfing experience. Nirwana Bali Golf Club at Pan Pacific Nirwana Bali Resort maintains a long history of association with IMG Golf Course Management who have been involved since 1994 during the pre-opening, through the official opening in 1997 and in a consulting management relationship that continues until today. IMG Golf Course Management is recognized for providing high quality services to an elite portfolio of clubs around the world. Partnering with IMG ensures delivery of meticulous standards of the operation and an unrivalled experience for members and guests. 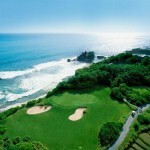 Be sure to compliment your round of golf with a stay at the magnificent Pan Pacific Nirwana Bali Resort. Here you will discover a lush 103-hectare hideaway built atop a sheer cliff with breathtaking views of the Indian Ocean and Tanah Lot. This secluded luxury golf resort, set in the tranquil village of Tabanan, West Bali is only 22km away from Ngurah Rai International Airport.